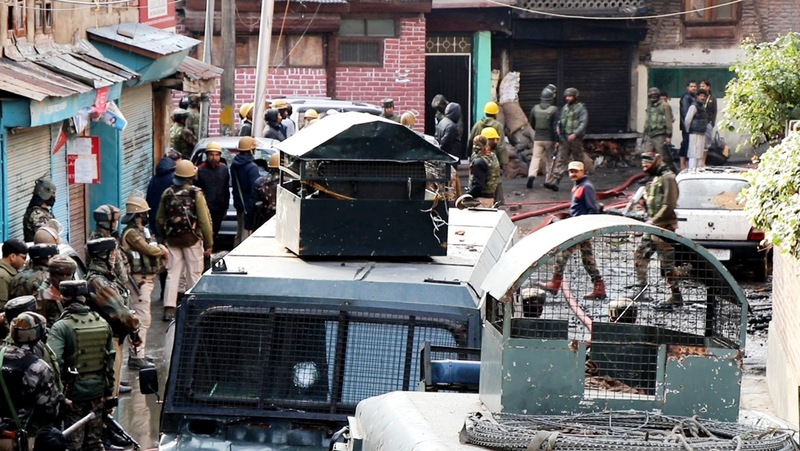 Police on Wednesday issued following statement about the Fateh Kadal gunfight saying that today on a specific input regarding the presence of militants in Syed Ali Akbar area of Fatehkadal, a cordon and search operation was laid by a joint team of police and CRPF personnel. “During cordon and search operation civilians were evacuated. While search operation was going on at the target location, militants made indiscriminate firing from inside,” the spokesman in a statement said. “In the ensuing gunfight, constable Kamal Kishore of JKP was killed while two JKP and CRPF personnel also received injuries,” he said. “During the encounter, all the two militants and their active accomplice refused to come out of the house and in turn fired upon the search party. Consequently, they were killed in the encounter. The eliminated militants and the active accomplice have been identified as Mehraj-ud-Din Bangroo, Fahad Mushtaq Waza and Rayees Ahmad,” the spokesman said. “Mehraj-ud-Din Bangroo @Asif @Piya son of Sona-ul-Lah Bangroo resident of Narparistan FatehKadal had a long history of criminal records pertaining to militant-related activities. He was involved in case FIR No. 146/2002 U/S 7/25 I. A. Act P/S M.R. Gunj, FIR No. 32/2007 U/S 307 RPC 7/27 I.A. Act P/S M.R. Gunj, FIR No 27/2016 U/S 302 RPC, 7/27 IA Act of PS Zadibal related to killing of two police personnel at Bagh-e-Ali Mardan Khan near Zadibal, FIR No 69/2016 U/S 302, 392 RPC 7/27 IA Act. of PS Batamaloo pertaining to killing of one police personnel and snatching of his weapon at Tengpora Batamaloo. He was also involved in several militant attack cases including of series of grenade attacks,” he in a statement said. “Faid Mushtaq Waza son of Mushtaq Ahmad Waza resident of Akilmir Khanyar was also involved in several militant-related incidents. Many cases were registered against him including FIR No. 45/2016 U/S 148, 149, 336, 332, 427 RPC, FIR No. 28/2017 U/S 147, 148, 149, 336, 152, 353 RPC at Police Station Khanyar. The complicity of Rayees Ahmad who was part of the group in providing shelter and logistics to the militants is being investigated,” said police spokesman. “Incriminating materials including arms & ammunition were recovered from the site of encounter. Police has registered a case in this regard and investigation has been initiated,” the spokesman in a statement said.